It's April and that means...Table Topics! Join us at our April man meeting Monday April 9, 2018. As we always encourage you to join us at 5:30 p.m. for networking. 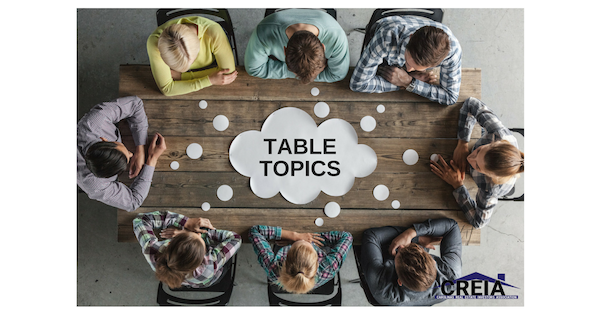 Our meeting will get started at 6:30 p.m.
We are excited to bring back Table Topics for the month of April as a small taste of our upcoming Real Estate 101 seminar. When we do table topics our format for the main meeting is switched up a little. This is a more intimate setting where four round tables are set up, one in each corner of the room. Four speakers, one at each table, discuss their niche topic to a small group at their table. The groups rotate every 15 to 20 minutes and the speaker repeats the discussion. Attendees get the opportunity to hear about all four topics from highly successful real estate investors within the CREIA community. This is a great opportunity to network, gather in-depth information and pick the brains of local industry experts. This years table topics sample includes: do it yourself property management; utilizing internet tools for investors; how to navigate the court house system for deals; real estate finance, deal structure and funding deals. We hope to see everyone on the 9th. Want more? Register now at CREIANC.ORG/RE101...Don’t Miss Out!